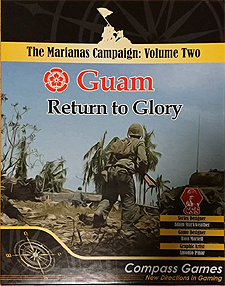 On December 10th, 1941, Guam became the first American territory to be lost to an enemy nation during World War Two. Three years later, the Americans returned to take it back. The landings were originally planned for June 18th, but the heavy casualties and fierce resistance caused the Americans to rethink their plans. Further reconnaissance of the beaches was performed, the scope of the preliminary bombardment increased dramatically, and the 77th Division was added as a floating reserve. Guam was subjected to the greatest naval shelling and air bombardment of the Pacific War to the point. The actual assault took place on July 21st and was unique in that the two landing areas were almost 7 miles apart. The two assault divisions would land on either side of the Orote Peninsular, link up, and seize the Airfield and liberate the Marine Barracks. Waiting for them were 18,500 Japanese soldiers with orders to stop the invaders or die. "I will not lose my courage, but now is the time to prepare to die! If one deserves to live, hope for death. Be prepared to die! With this conviction, one can never lose...Look upon us! We have shortened our expectancy of 70 years of life to 25 in order to fight. What an honour it is to be born in this day and age."